Well, 2007 was a great year and a tragic year at the same time. I've been working on a post on the tragic event that happened in December, but it's still a very emotional subject for me to write about. Luckily, it wasn't a death or life threatening illness of a family member...that would have been the worst thing that could've happened, but this was nevertheless very hard to deal with and one of the worst things that could happen to a family. So, that entry will show up soon. One of the best things about 2007 was buying a house with DK. My favorite gifts--an anniversary present and holiday present were presented to me in Vegas--OK, DK bought them while we were there around the holidays. I had been searching for a continental wallet for sometime since my Coach wallet was falling apart and too small for all of my various cards. I'd had it for around 5 or 6 years so it had a good run. I needed to find a wallet with many card slots to fit various cards I have including my KCRW and Groundwork’s coffee card. I don't even have a lot of credit cards or department store cards! At first I wanted a Louis Vuitton wallet that had a funkier look, but in person its yellow stitching was yucky. Then I wanted a Bottega Veneta wallet, but it was only so-so in person. I fell in love with a black patent leather Miu Miu wallet with silver hardware (with a lock and two keys)that's funky, young and sophisticated and the bonus was that it happened to be reasonably priced. It has 16 credit card slots and the most amazing layout. It's so perfect that I wish I could tell you it's name* and show you a picture of it, but I don't know the name and I've scoured the internet for a picture of it. I bought it at the Saks Fifth Avenue in Las Vegas. Staying at the Wynn hotel is dangerous because it's across from the fashion mall and its promenade of shops is gorgeous. 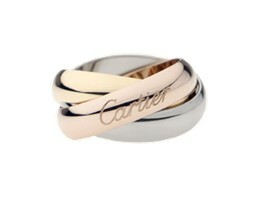 I finally got the Cartier trinity ring that I've wanted for a long time. DK had forgotten that I wanted it. He did manage to surprise me with it at a fabulous dinner at Mix. Being truly surprised is so rare. What were your favorite holiday gifts? I was happy to receive a gift from my boyfriend that I had been eying for quite some time now, the LAMB Oxford bag. It's a heavy duty purse that can take any daily abuse, which is great since the Marc Jacobs bag I had been carrying for a year was looking haggard due to it's super soft leather, which lead to many scratches and mystery marks, plus there was the time when a full bottle of water leaked inside my bag, discoloring 45% of it. One of the great things about the Oxford is its price, especially now that the new crop of bags have come out.